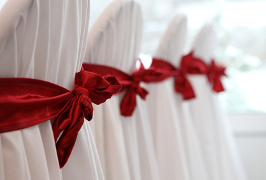 We rent wedding banquet chair covers for affordable prices to make your wedding perfect. We work hard to keep our prices low. 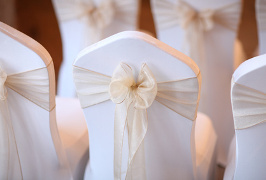 White chair cover rentals are as low as $1.25 (setup starts at $50). We'd love to help make your special day the one you've always dreamed of. We want to keep prices affordable for our local community. Just $1.25 per chair cover. Setup starts at $50. Choose from red, burgundy, orange, moss green, aqua blue, orchid purple, chocolate, white, gold, and pink. It's your special day. We'd love to work with you to make sure your wedding is perfect. We'll arrive a few hours before the event start time depending on location business hours and quantity ordered. Our covers fit standard banquet chairs, standard folding chairs, and stackable chairs. Contact us if you're unsure. Call Kim at 408-828-4100 or email her at with any questions. Also see our FAQs. What can I do to hold my date? A non-refundable deposit of $50 with signed agreement is due to reserve your date and materials. Your final payment and final count will be due one week prior to your event. If you book two weeks or closer to your event date, the bill is due in full with the signed contract. We accept cash, check, and money order. In the event of a returned check, you will be responsible for a $25.00 returned check fee. The price includes a set up, take down, and travel fee starting at $50. What happens if the linens are damaged or go missing? The Customer will be responsible to pay for any incidents including but not limited to damaged, lost, altered, or stolen items. Except for reasonable rental usage all items must be returned in their normal condition. We can take out most stains. However, for each item returned with tears, wine stains, candle burns, or wax marks that may be damaged beyond repair. What happens if we end up cancelling our event? Orders that are canceled 14 days or less prior to the event are charged the full deposit amount thus all deposits are nonrefundable. Please email Kim at . Placing Orders: To place an order, full payments must be received. A deposit will reserve items for the date specified within the order but the items will not be rendered until full payment is received by 14 days prior to the event date. By making a payment, the customer agrees to the terms within this contract. Security Deposit: A deposit of $50 check payment is required to hold the rental items for the date specified in the Event Order Form. This deposit will apply toward the remaining balance, which is due 14 days prior to the event. Event Cancellation: Orders that are canceled 14 days or less prior to the event are charged the full deposit amount thus all deposits are nonrefundable. Samples: The Customer understands that it is their responsibility to ensure the proper fit and color of the rental items. Samples are offered to make sure of this. Refunds will not be granted in the case that the fitting, size, color, or texture does not match. Damaged/Unreturned Items: The Customer will be responsible to pay for any incidents including but not limited to damaged, lost, altered, or stolen items. Except for reasonable rental usage, all items must be returned in their normal condition. We can take out most stains. 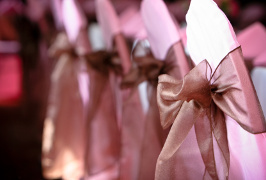 However, for each item returned with tears, wine stains, candles burns or wax marks that may be damaged beyond repair. Responsibility: The Customer is responsible for making sure the facility allows outside chair cover companies. We are NOT responsible for any kind of injury whatsoever, due to falls off the chair, or from any kind of injury that could or might occur per use of our linens.